The Flemish artist Albert Servaes (1883 - 1966) was a pioneer of expressionism in religious art whose work was part of a significant engagement with modern art on the part of Roman-Catholic artists in the early part of the twentieth century. In 1919, as Servaes was working on the charcoal drawings for his famous Stations of the Cross at Luithagen, both Maurice Denis in France and Alexandre Cingria in Switzerland were forming groups of artists that would produce significant work for many churches in subsequent years. Servaes’ Stations proved controversial because of their expressionist nature and were eventually removed from the Carmelite Chapel in Luithagen for which they had been commissioned. Nevertheless, Servaes received support from significant Catholic figures including Father Titus Brandsma, Father Garrigou-Lagrange O.P., Father Jerome of the Mother of God, Pastor Thomas Kwakman, Jacques Maritain and Cardinal Mercier. Servaes understandably felt betrayed by the Church which ruled against his work, yet was compelled to continue to create religious work because of his spiritual insight and inspirations. 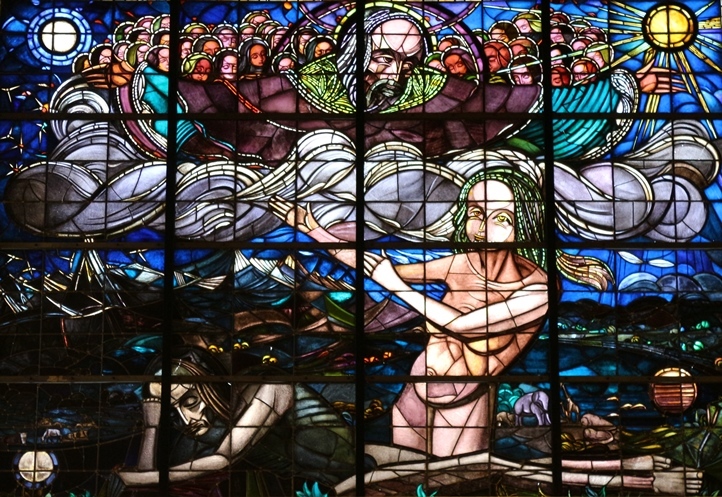 In 1937 he collaborated with the internationally renowned Belgian master glazier, Florent-Prosper Colpaert (1886-1940), to produce three large stained-glass windows for the World Exhibition in Paris, entitled The Creation of Eve, The Expulsion of Adam and Eve and The Last Judgement. Colpaert was active in the Liturgical movement centred on the Benedictine monasteries of Maria Laach and Beuron. Servaes, by contrast, drew on the mystical spirituality of the Carmelites. The two men disagreed over approaches to colour and shading within Colpaert’s realisation of Servaes’ designs with the result that these windows are not representative of Servaes’ work overall. 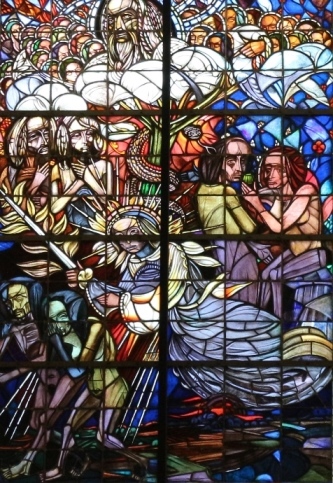 In 1939 the windows were donated by the Ministry of Economic Affairs to the church wardens of the Church of the Holy Family in Woluwé-Saint-Lambert, a district of Brussels, who housed them there. Classified as monuments in 1992, these three pieces are the only stained-glass windows designed by Servaes that have survived in Belgium. In contrast to the minimal figural focus of Servaes’ Luithagen Stations, these are busy designs filled with figures and faces. The colours and contrasts are generally brighter than is usual within the work of Servaes and, despite the themes which include expulsion and judgement, the look and feel of the work has less of the anguish and strain that characterises much of Servaes’ oeuvre. The design of The Creation of Eve has similarities to William Blake’s Elohim creating Adam in its use of upper and lower horizontals to position the creative Father surrounded by angels and the recumbent Adam from whose side a vertical Eve has risen. Mountains and clouds separate God from humanity, while a sense is given of an emergent and exotic Eden in the landscape and animals that surround Adam and Eve. The Expulsion of Adam and Eve and The Last Judgement form a pair in which the protagonists and action zig-zags towards the bearded figure of God the Father in the top left light of both windows. In The Expulsion an angel with a flaming sword traverses the window diagonally, while in The Last Judgement, the movement is from the Madonna and Child to the Sacred Heart of Christ. The busyness of the cramped crowds thronging heaven and earth suggest that what these windows strain towards, unity and harmony, is the ultimate end as all is gathered in and made one. With these designs Servaes is ultilising the static character of Symbolism more than his usual expressionist energy. They are also dense in detail. It is possible that Servaes’ original intention was a more dramatic design, which was not fully realised by Colpaert. What is certain is that as the darker and simpler of the three, The Creation of Eve is the strongest of this set. Servaes’ drawings and paintings have greater expressive force and feeling through the personal manipulation of charcoal and pigment than the static symbols of these windows. 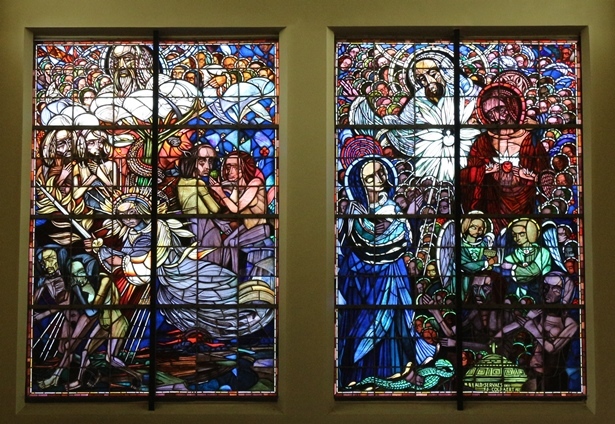 While his personal mysticism, nurtured through Carmelite spirituality, accords more closely with the expressionist flow of the drawings and paintings, these windows stand as a testimony to the gradual realisation within the Roman-Catholic Church that Servaes was both a significant artist and a major religious artist. As such, they are to be celebrated. Albert Servaes: The Creation of Eve, The Expulsion of Adam and Eve and The Last Judgement, Church of the Holy Family, Woluwé Saint Lambert, Brussels. Jonathan Evens is Priest-in-Charge at St Stephen Walbrook and Associate Vicar for Partnership Development at St Martin-in-the-Fields, London, England. A keen blogger, he posts regularly on issues of faith and culture at www.joninbetween.blogspot.co.uk. His journalism and art criticism ranges from A.W.N. Pugin to U2 and has appeared in a range of publications, including the Church Times. He runs a visual arts organisation called commission4mission, which encourages churches to commission contemporary art and, together with the artist Henry Shelton, has published two collections of meditations and images on Christ's Passion. Together with the musician Peter Banks, he has published a book on faith and music entitled The Secret Chord.